Brendan Boylan ’19 and Samir Tawalare ’19, as the only ticket vying for president and vice-president of Student Assembly, are unique candidates in a unique situation. Running unopposed — for the first time in Student Assembly history — gives them an obvious advantage. However, it has also presented a disguised obstacle; without the forced urgency of a competing ticket, Boylan and Tawalare have been running their campaign at a much slower pace than past SA presidential tickets. The campaign period officially began Monday, March 12, but they waited until Thursday, March 15, to release their platform to The Flat Hat and have not publicly published their platform as of the date of publication. However, their delayed pace is balanced by an opportunity to listen more deliberately to groups within the campus community. This input from organizations across campus will give the candidates the chance to hone their platform not just over the course of their campaign, but also over the course of their year in office. 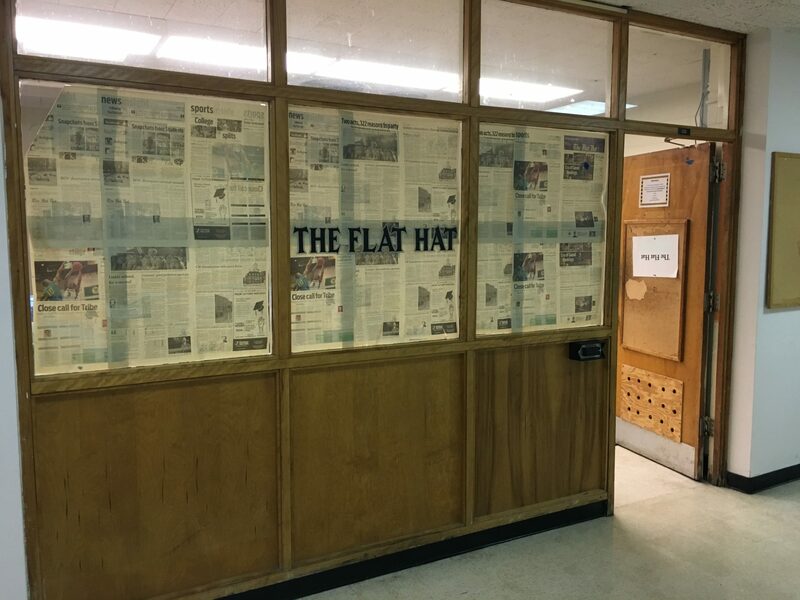 The Flat Hat chooses to endorse Boylan and Tawalare with an understanding of their unique situation, alongside their proven commitment to community service and meaningful involvement in multicultural and activist groups across campus. We expect to see these candidates improve as they rise to the challenge of assuming the highest positions in student government. Boylan, who has been a senator for the class of 2019 since his freshman year, has a strong institutional knowledge of SA. Additionally, he has shown an ability to learn from his mistakes and to help inform future decisions. He has also committed to listen to the campus community, especially marginalized groups. In his interview with the editorial board, Boylan mentioned that he has sometimes struggled to find the right approach when confronting issues in SA. When he authored the Survivor Solidarity Resolution in spring 2017, for example, he ran into issues when he realized that his committee created redundancy with sexual assault advocacy groups that were already leading initiatives. However, Boylan seems cognizant of the importance of facilitating the work of student groups and has made an effort to counter a tendency to repeat his past mistakes in this campaign. Tawalare, despite being an SA newcomer, has a well-known presence on campus and has brought excitement for his vice-presidential role to the campaign. He is personable and has created wide-reaching bonds on campus based on his involvement in the South Asian Student Association, Griffin School Partnerships and his band Talk to Plants. His lack of institutional knowledge of SA could present a challenge as he is expected to lead weekly Senate meetings, but he appears invested in learning more in order to be able to effectively operate within the organization in the fall. The strengths of Boylan and Tawalare’s campaign mirror their strengths as individuals. Their enthusiasm is palpable and they have genuine concern for the student body, especially marginalized and underrepresented groups. The portion of their platform with the most concrete proposals is probably their planned budget reforms. They plan to translate the information they receive from communication with other organizations into a reallocation of funding based on the $739,900 SA budget for this year. Specifically, Boylan and Tawalare mentioned wanting to look closer at AMP, which receives significant funding from SA each year, as a potential source for restructuring cuts that could be directed to initiatives like funding for transcripts. This has the potential to reach more students. Boylan and Tawalare’s desire to be transparent, while noble, has not yet been fully realized. Though transparency forms a large part of their platform, they have opted to not make a website for their campaign, as of publication. To encourage future transparency, they plan to develop a department of outreach, and will utilize social media as a tool for connecting with students and organizations. There are many clubs and organizations cited by name in the platform, and we hope that Boylan and Tawalare will continue this outreach and will transition it to meaningful policy. The platform can be overambitious. Boylan and Tawalare cite the hiring and retention of faculty of color, the facilitation of academic credit for ROTC students and support of the COLL 199 credit as issues they support. These are largely performative stances as SA generally lacks the authority to sway these administrative decisions. Nonetheless, they point toward the heart of the campaign, which prioritizes diversity at all levels of the College institution. Both Boylan and Tawalare have proven their dedication to the campus community through their extensive outreach efforts. The two have room for growth, especially in the transparency and specificity of their platform and proposed policies, and they are by no means free of fault. However, the initiative shown by Boylan and Tawalare in their involvement on campus as well as within this campaign should give students faith that both individuals will listen to the campus community. It is the hope of The Flat Hat that this will allow them to continually improve as candidates and, eventually, lead the 2018-19 SA as president and vice-president with purpose and efficiency. SA has the capability to influence the College through its considerable budget, but it also serves as a symbolic representation of campus culture. If Boylan and Tawalare follow through on their intentions, they would create a culture in SA which would facilitate important work being done by students from every corner of campus.